Things heat up in a hurry in the kinetic first trailer for A24’s coming-of-age thriller Hot Summer Nights, the feature debut of writer-director Elijah Bynum, starring arguably Hollywood’s hottest young actor, Timothée Chalamet (Call Me By Your Name, Lady Bird), alongside It Follows breakout Maika Monroe and Alex Roe (The 5th Wave). The film opens this summer, naturally. 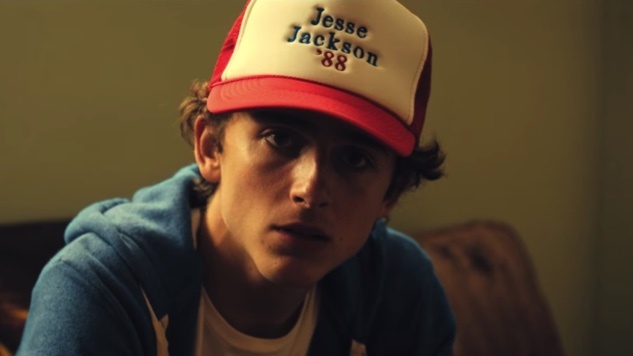 Hot Summer Nights, set in Cape Cod over the course of its titular season, follows awkward out-of-towner Daniel (Chalamet) as he falls in with the neighborhood rebel (Roe) and gets in over his head selling weed. Meanwhile, Daniel strikes up a romance with the dealer’s enigmatic sister, McKayla (Monroe). The stakes (and temperatures) rise from there against a backdrop of drive-in movies, arcades and crashed parties, all while a literal hurricane looms. The trailer unspools this familiar-feeling plot with style to spare, balancing its verve with menace (looking at you two, William Fichtner and Thomas Jane), and presaging quite a wild coming-of-age tale. Hot Summer Nights, which premiered at SXSW, will be Chalamet’s first starring role since he landed his first Oscar nod (at the tender age of 22, no less) for his outstanding turn in Luca Guadagnino’s Call Me By Your Name. He’ll next appear in Felix Van Groeningen’s drug addiction drama Beautiful Boy opposite Steve Carrell, and in David Michôd’s Netflix period epic The King. Hot Summer Nights hits DirecTV on June 28 and theaters on July 27. See the first trailer below.